Ahmed bin Abdullah Balala is an Indian politician from the city of Hyderabad. He represents the Malakpet constituency in the Telangana Legislative Assembly on a All India Majlis-e-Ittehadul Muslimeen seat. He first won the seat in 2009 and retained it in the 2014 polls. 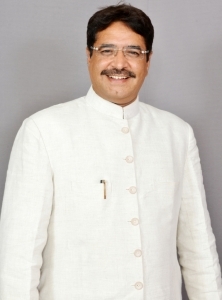 Ahmed bin Abdullah Balala won from the Malakpet constituency in 2009 by defeating Muhammad Muzaffar Ali Khan of Telegu Desam Party on a All India Majlis-e-Ittehadul Muslimeen ticket. Previously his party unsuccessfully contested from the seat in 1989 and 1994. In December 2011, when officials of the Archaeological Survey of India tried to demolish the shops and enroachments around the Badshahi Ashurkhana, AIMIM MLAs Balala and Syed Ahmed Pasha Quadri along with their supporters objected, leading to development of tension in the city. In 2014, Balala campaigned for the party in the Maharasthra Assembly Polls. After the results were declared, where his party won 2 seats, Balala said that the reason for their success was because of the ibjustice done to Muslims. In April of the same year, he was renominated by the party for the same Malakpet seat in the Telegana Legislative Assembly polls. He emerged victorious by defeating Venkat Rao of the Bharatiya Janata Party by 23 thousand votes. member of All India Majlis-E-Ittehadul Muslimeen.